AMD's "AM" sockets can be quite confusing because you can use an AM2+ CPU in an AM2 socket, but an AM2 CPU will not work in an AM2+ socket. Meanwhile, an AM3 CPU will work in either an AM2 or an AM2+ socket! 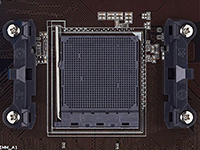 But whichever CPU you are using on whichever motherboard, you will find that the CPU socket and surrounding plastic frame are actually the same for all sockets. Therefore if a cooler will physically fit AM2 then it will also fit the other sockets. Just bear in mind though that this does not necessarily mean it will be suitable for an AM3+ CPU, because it might not be able to cool it sufficiently well. As always, if you are still unsure which CPU cooler is right for you, please read our article "How do I choose a CPU cooler?" and remember to check the TDP of your CPU to aid identifying a suitable cooler. The table below provides information about each cooler to help you quickly identify the most suitable product for your needs. Each column can be sorted, making it easy to determine a cooler of a certain height or a specific noise level. Please note, AIO water coolers are not shown on this table due to their unique characteristics. Narrow fin depth ensures greater compatibility with memory modules fitted with large heatsinks.